PHOENIX —The rumors lingered in the open, signaling the inevitable final play call. You knew it would happen eventually. And yet, a game without Rob Gronkowski is still an unimaginable sight. Many of us are still not ready for this dizzying ride – complete with his goofy grins, meathead “bro talk” and majestic touchdown catches – to end. And yet, here we are. After nine NFL seasons, New England Patriots tight end Rob Gronkowski announced his retirement Sunday on social media. His body — the 6-6, 265-pound vessel thathe used to carve out his own path, carve up defensive schemes and compile a Hall of Fame-worthy résumé — is not what it once was. The physical decline was evident, yet his presence on the field still loomed large. Rumors of his impending retirement had lingered since 2018, following the Patriots’ loss to the Eagles in Super Bowl LII. 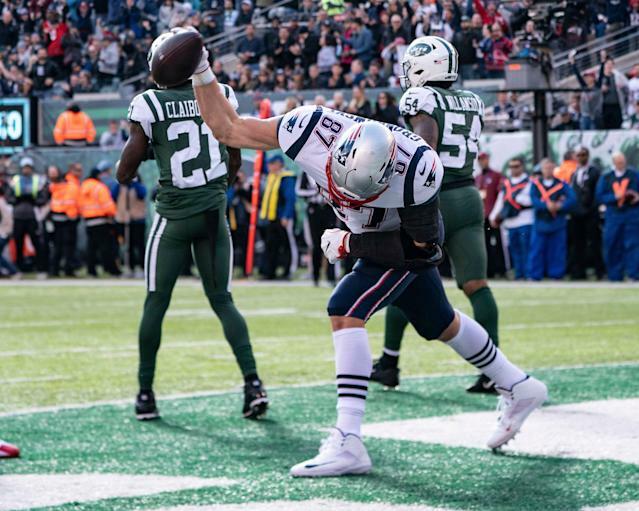 But, perhaps fittingly, Gronk’s official curtain call comes almost two months after the Patriots’ impressive victory over the Los Angeles Rams in Super Bowl LIII. He tormented AFC East opponents, in particular. But he saved some of his best performances for postseason play, when all the world was watching. He was bigger than just a tight end. He was the best for much of his career. He transcended the position and he helped changed the Patriots’ offense. Gronkowski was selected in the second round of the 2010 draft. Aaron Hernandez was selected in the fourth round that same year. 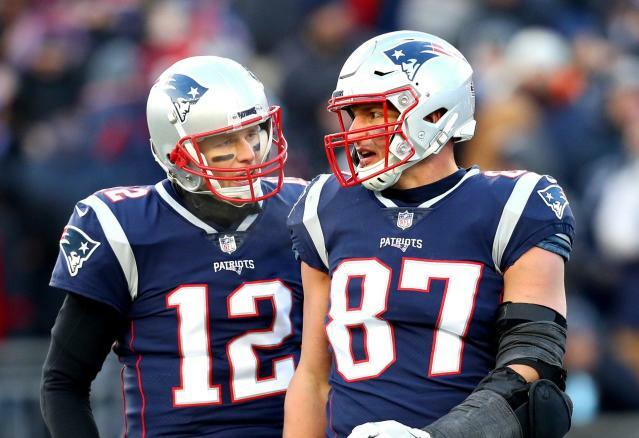 Together, the two tight ends wreaked havoc on the field, converging to create a dynamic 1-2 punch in Tom Brady’s ever-changing arsenal of weapons. But those days feel like a distant memory, especially today. The careers of those two young stars couldn’t have played out more differently. One realized his dreams. The other became a tragic, cautionary tale. Hernandez, a convicted murderer, left this earth almost two years ago, hanging himself in his jail cell. Gronkowski, meanwhile, is walking away from the game on his own terms. Just like he played it. He was different. He was fun to watch and be around. His energy was childlike. His enthusiasm boundless and unbridled. In Bill Belichick’s tightly controlled monosyllabic world, Gronkowski was the outlier — full of life and laughter for all the world to see. Even his crotchety coach. His love of life and football were uniquely infectious. He was dominant. And, arguably, the best to ever do it. His speed. His size. His smarts. Gronkowski was the no holds barred frat boy that defenses couldn’t stop no matter how hard coordinators tried. He was beloved by teammates as much for being the free spirit, as he was the ferocious blocker blessed with hands soft enough to pluck passes from the air. “Rob will leave an indelible mark on the Patriots organization and the game as among the best, most complete players at his position to ever play,” Belichick said in a statement. Over the past few seasons, Gronkowski’s body had betrayed him. And just like that, the game’s most dominant pass-catching machine was rendered mortal. “Thank you to all of Pats Nation around the world for the incredible support since I have been apart of this 1st class organization. Thank you for everyone accepting who I am and the dedication I have put into my work to be the best player I could be. But now its(sic) time to move forward and move forward with a big smile knowing that the New England Patriots Organization, Pats Nation, and all my fans will be truly a big part of my heart for rest of my life. His impressive career, which included five Pro Bowls and four All-Pro selections, was littered with an array of “Gronk Spikes,” smashed beer cans and awkward dance moves along the way to entertain us all. Gronk made the game better. And the game was better for him.